Sure, people have been saying, “A picture is worth a thousand words,” for at least a century, but images have never been more integral to effective marketing and communications. Facebook posts, Tweets, etc. get much more traction when they contain images. Instagram and Pinterest are two of the fastest growing social networks. Giant background images dominate website design. What’s driving this emphasis on visuals? Millennials, for one thing. Millennials, who will make up 75 percent of the global workforce by 2025, are digital natives who think in images. And the ubiquity of smart phones, free photo editing apps, and live streaming video apps like Periscope and Meerkat. Are you ready for your close-up? If not, use our 5 tips for creating better images. What stories do you want to tell your audience? How do you want people to react when they see your images? What do you want them to think, feel, do? How can you convey the spirit of your work through pictures? Here are some traits of successful social media images. Where will you be using the images? What sizes and formats will you need? What resolution? I know you’re going to ignore this advice (heck, I usually ignore it myself), but if at all possible, hire a professional photographer. Really. The spontaneous shots that you grab on your iPhone are great for social media and casual use, but if you’re planning on using a large image on your responsive website or printing glossy postcards, little things like high resolution, focus, and photo styling really matter, as do professional editing skills. Photo by m01229, Creative Commons. Do you need a fancy camera to take decent photos or is your smart phone good enough? Depends on what’s in the picture. Here’s a great “shoot-out” comparing an iphone 6 to a DSLR and a point-and-shoot. Sticking with your phone camera? There are lots of ways that you can get great photos from your smartphone. 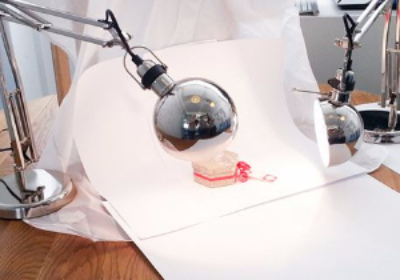 Product photography has a huge impact on sales. If you can’t hire a professional photographer, Moo.com shows you how to use tools like lighting and photo tents to create beautiful product shots. Moo.com – Product Photography on a Budget. Regardless of what type of equipment you’re using, how you compose your shots plays a key role in creating a memorable photo. Here are the Ten Top Photography Composition Rules to inspire you. When your own photos are iffy and you can’t afford to hire a photographer, stock photos can save the day. 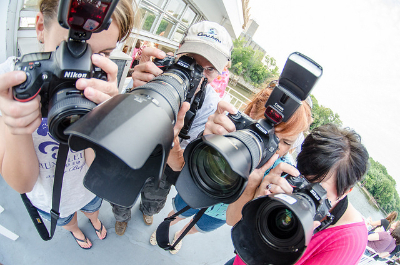 The risk with stock photography–paid or free–is that it can look canned or staged. If you want to use an image for your logo or on a t-shirt you plan to sell, check to see if the licensing requirements permit it. With stock photos, you also run the risk of using the same image as the store down the street. So use stock images very thoughtfully, as Tim Gunn on Project Runway would say. Many stock photos companies offer wonderful still and video images, such as Shutterstock, istockphoto, Dreamstime, fotalia, Getty Images, and Alamy. Purchasing the rights to the photos can be pricy, but some of these sites do offer free or low-cost options. Fortunately, there are quite a few sites that allow you to download photos and display them for free or at minimal cost, as long as you acknowledge the photographer. 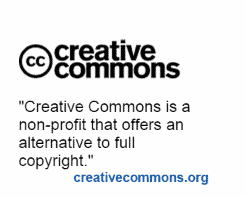 My personal go-to for free images is Creative Commons on Flickr. When you go to the site, enter key words into the search bar in the top right. When the images pop up, go to the drop down License menu on the top left and choose which licensing type you want; for example, choose commercial use allowed if you want to use the photo for a for-profit business or modifications allowed if you want to alter the photo. Other free/low-cost sites include morgueFile, Imagebase, Freepixels, and freeimages. And you can find many other stock photos sites on the web. 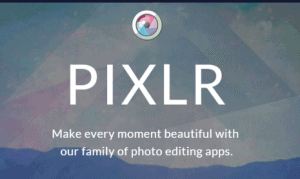 It’s easy to find an image-editing program or app that you feel comfortable using. If you don’t have the time, money, or patience to learn PhotoShop or other professional editing software, you can try the image-editing software or app that likely came with your computer or phone or download one of the many programs. Here’s a rundown of some of the best free image editing programs. Many of the programs allow you to add filters or create special effects. Some, like picmonkey, let you add text, images, and icons. My personal favorite is pixlr. It’s free, fast, and easy. I just upload an image and I can easily crop it, resize it, rotate it, adjust the brightness or contrast, or make other improvements. While you’re at it, make sure your images are saved at the appropriate resolution and size for the channel or setting where they will be used. Here’s some good tips for optimizing your images for the web and a useful image size cheat sheet for social media. Is creating great images a snap for you? Please share your tips for taking great photos, finding good stock photo sites, or using photo editing apps.